More special moments during Paint Mexico City with Judy Wise and Katie Kendrick. 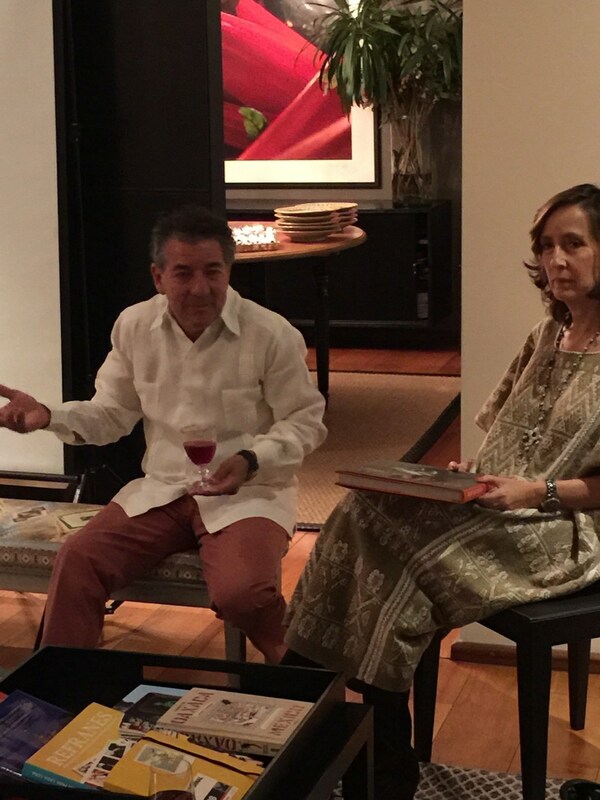 A very special evening was spent with friends photographer Nacho Urquiza and his wife, food stylist Laura Cordera in their beautifully decorated, art filled home where they provided a very special meal for our group based on the book, Fiestas de Frida for which Nacho was the photographer. Laura selected recipes from the book and we happily indulged ourselves and listened to wonderful stories told by Nacho about his family's association with Frida and the story behind his shoot for the cookbook. We traveled to Frida and Diego Rivera's Blue House which was a moving experience for many in the group. It's quite the experience to actually see where Frida lived for twenty years, see her studio, where she slept and her clothes including the many braces she endured while wearing them. Interesting note, Nacho told us that while he was photographing for the Frida cookbook, he was allowed with special permission to take pictures in the house for only 30 minutes. If you have ever been on a shoot before, you understand the impossibility of that time frame. Of course, Nacho did it and accomplished what he needed. Next up was Dolores Olmeda Patina's enormous house with quite a few paintings by Frida and Diego. There is a lot of controversy over her collection and how she ended up with the paintings. We finished the day on the ancient waterways of Xocohmilco where we floated, like Frida, in our trajinera accompanied by musicians and another boat that provided us with delicious mole. 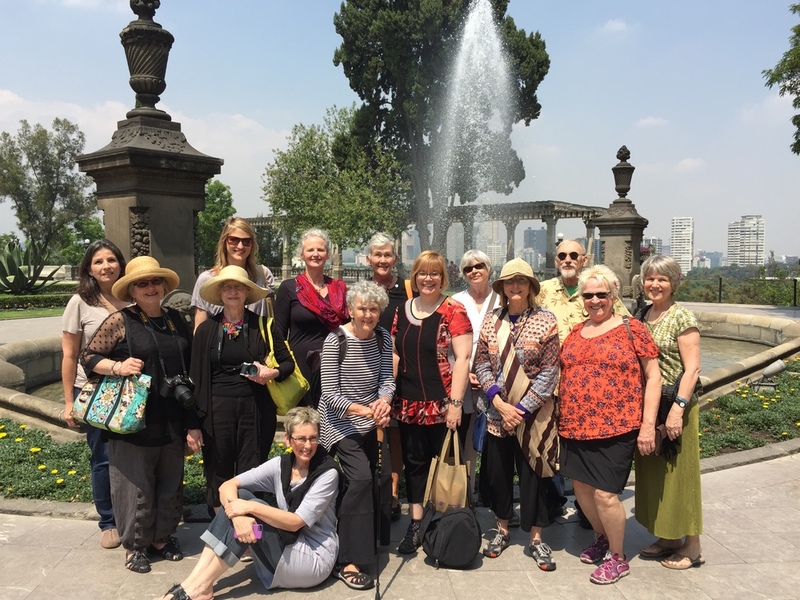 Visiting Chapultepec Castle was another fabulous moment on our trip. Set high atop what is known as grasshopper hill, it has wonderful vistas that overlook the city and Chapultepec Park. We wandered through what was Emperor Maximilian and his wife, Carlota's castle for three years during his reign. It is filled with beautiful artwork and furnishings. 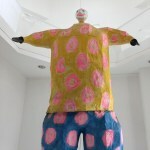 One of my favorite museums in Mexico City is the Arte de Popular filled with popular art from throughout Mexico. Here are just a few pictures of what is inside. 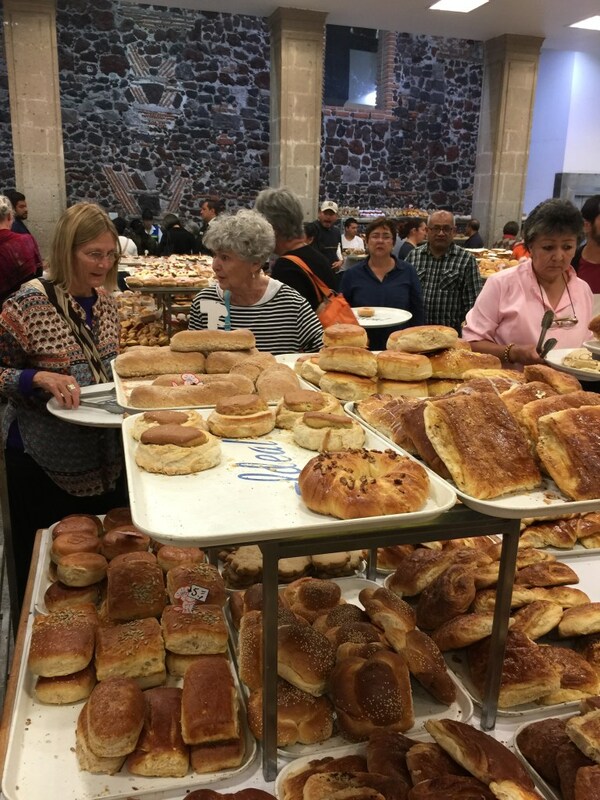 After eating comida at the blue tiled Sanborns near the zocolo where the filming of the latest 007 movie with Daniel Craig was wrapping up, we stopped in at the Pasteleria Ideal where enormous cakes bought by the kilo were showcased upstairs in the 2-story bakery. The first floor smelled like heaven with its enormous collection of breads, cookies and gelatins. You grab a tray and pile it high with your goodies before checking out. It was a sight! Luckily we were full so we were not tempted. Our final meal together was at Pleno, a neighborhood restaurant that was just outstanding. Chef Alberto Kalach and his staff provided wonderful service, beautifully plated food which tasted as great as it looked. We had a wonderful evening and it was hard to say farewell to the this wonderful group of artists (and significant others) but we welcome each of them into our art tribe. Until the next trip - Bali with Judy and Sue Stover in September, and then San Miguel de Allende in October, and a hint as to what is to come in May 2016. Apr 7 Viva Frida and Danger!